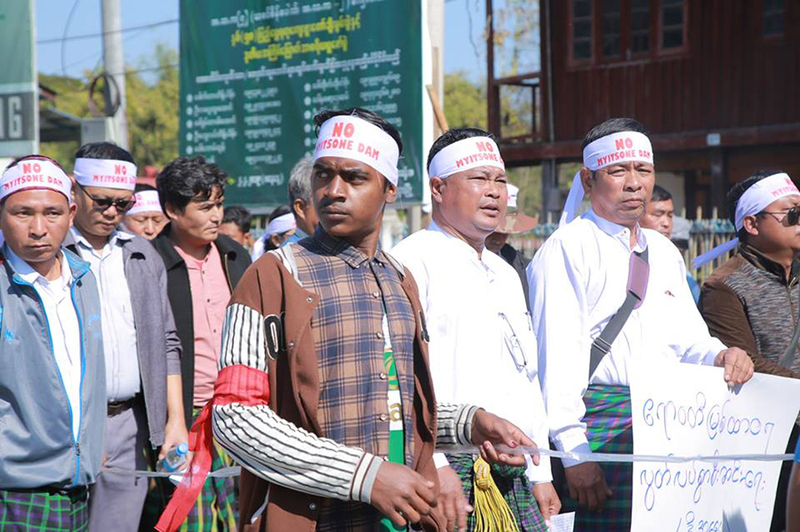 YANGON—Around 10,000 members of the Kachin community on Thursday morning staged a protest march in Kachin State’s Myitkyina calling for termination of dam projects both upstream and downstream on the Irrawaddy River. While Myanmar is bound to suffer serious environmental impacts if the Myitsone Dam project goes ahead, China will take 90 percent of the electricity produced, lead protester Steven Naw Awng said, explaining the reason behind the rally. “The mega dam is not for us. But we will lose our lives and property because of it. So, we are all gathering to express our opposition [to the project] and demand its termination so that the Irrawaddy [River] can flow freely,” he told The Irrawaddy, adding that organizers sought approval from the concerned authorities to stage the protest in line with the Peaceful Assembly and Procession Law. 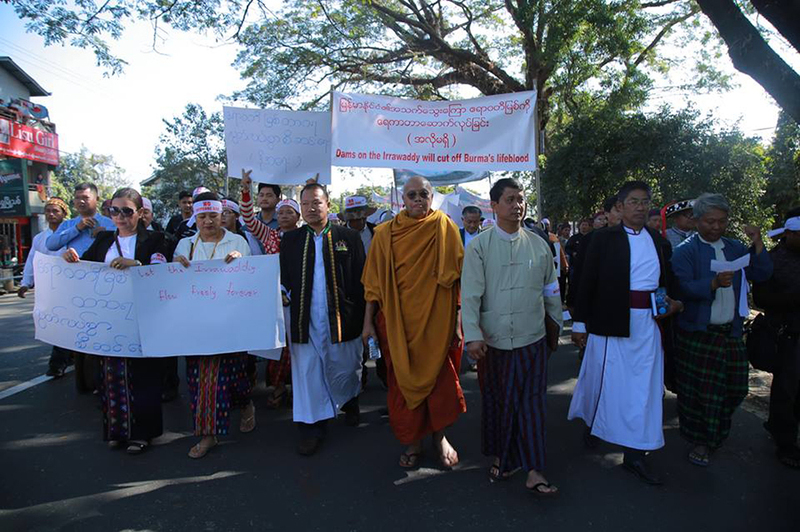 Kachin religious leaders, Buddhist monks, leaders of Kachin political parties, Kachin civil society organizations, activists and locals from Myitkyina and Waingmaw townships joined the protest. 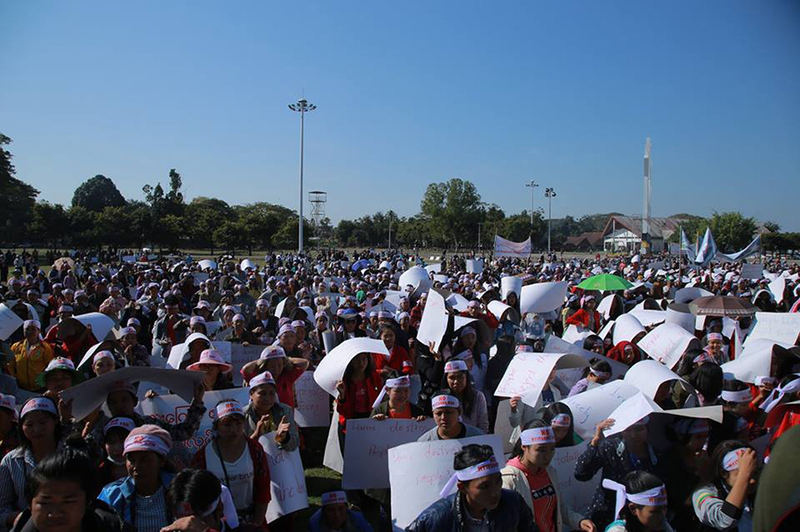 Protesters gathered at the Manaw Ground at 8 a.m. and marched around the town after the religious leaders and activists spoke against the dam project. “I have joined the protest not because I hate China. I don’t hate it. I just don’t want this project,” said Lura, a local of Tang Phre village whose house is in the dam project area. Chinese Ambassador to Myanmar Hong Liang visited Kachin State from Dec. 28-29 and met leaders of the Kachin State Democracy Party, Kachin Democratic Party, Unity and Democracy Party Kachin State as well as Kachin religious leaders. Following his visit, the Chinese Embassy released a statement saying that the Kachin people are not opposed to resuming the dam project. 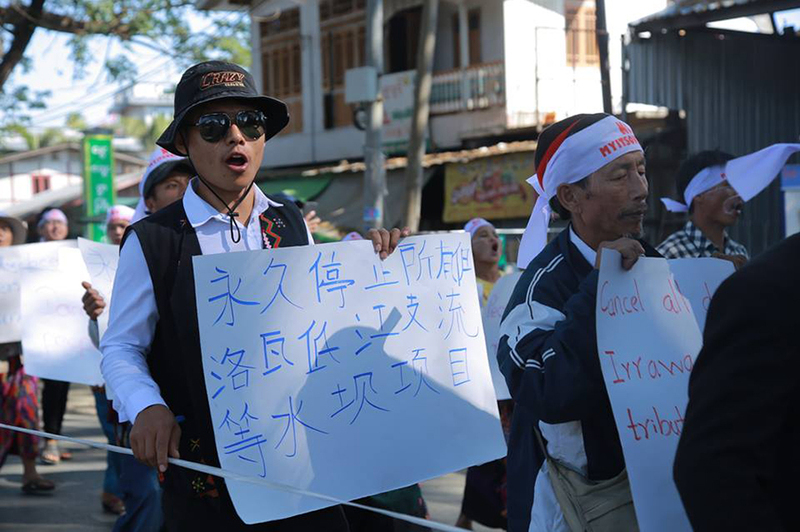 The following day, local political parties in Kachin State called the Chinese Embassy’s statement “inaccurate and misleading” and said the Kachin community wanted to “permanently” shelve the project. Protesters called on the government to stand by the people. During the protest, the chief of Myitkyina’s Police Station No. 1, Police Major Myint Moe, sent a letter of complaint to the protesters, saying the event was illegal. According to police, protesters used loudspeakers though they were only allowed to use megaphones. They also wore headbands and engaged in other activities without permission, police said. “As they violated Section 10 of Chapter 5 of the Peaceful Assembly and Procession Law, we will take action in line with law,” Pol. Maj. Myint Moe said. The multibillion-dollar project was suspended in 2011 under U Thein Sein’s administration amid public concerns over its social and environmental impacts. Over 1,000 locals have been displaced by the project, forced to move into housing built by the Chinese company that was slated to construct the dam. As they do not have work in the new location, they have to rely on food supplies provided by China. The project is currently suspended. At a meeting with Myanmar military chief Senior-General Min Aung Hlaing on Tuesday, Kachin religious leader called for the termination of the dam project. The military chief said a final decision on the Myitsone Dam would depend on the public’s wishes and on Parliament.